My pilgrimage will be culminating in the 24-7 Prayer International Gathering in Dublin, Ireland. At each gathering they have a fundraising auction. This year the Gathering Auction theme is “scarves with swag”, and we have been encouraged to bring some kind of creative scarf. I wasn’t sure what to bring, and in the flurry of last minute packing, was feeling a bit stressed about it. All of a sudden last night, I got a brainwave. 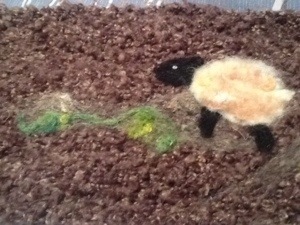 I grabbed an old boiled wool scarf (I loooooove boiled wool), my needle felting kit, and began to create. My scarf is going to be called “I just wanna be a sheep”. Remember the old kids song? “Baa baa baa baa, and I pray The Lord my soul to keep, I just wanna be a sheep”. I will work on it at various point in the pilgrimage. “Make sure you don’t pack the needles in your inflight bag!” my friend and travelling buddy Nicola exhorted me. So if I manage to get to the British Isles with needles unconfiscated (we just won’t talk about the time I smuggled a machete back from Uganda), I will poke away (pun intended) at my scarf until Gathering time. In five days I leave for the British Isles, along with my daughter Hannah and four other members of our GOHOP community. We are spending three weeks exploring ancient and new Monastic communities. Our journey will take us to London, where we will visit two 24-7 Boiler rooms, and then head north to Northumbria and the Holy Isle of Lindisfarne. Then it’s across to Scotland and Iona. Then we fly from Glasgow to Dublin, and spend a week with the 24-7 family at the International 24-7 Prayer Gathering. I met with Sue, my spiritual director today. “What are you expecting from pilgrimage?” She asked. I thought about my last pilgrimage to Israel, three years ago. I liked Jerusalem, but I LOVED the desert springs of EnGedi. There was something magnificent about being in the wild, desolate places, looking for God. 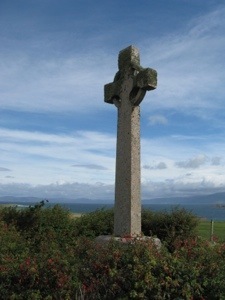 Lindisfarne and especially Iona are remote holy, thin places steeped in ancient Divine encounters. “Okay, let me get to the absolute highlight. The hour we spent in the prayer room was an unexpected and powerful God-encounter. I mean, I guess we expected to encounter God somehow in prayer, but this was deep. Laurie Castellani, from YWAM but working with GOHOP, led us in some different kinds of prayer, some stuff we’ve never done before. We sang scripture freestyle, we prayed out loud all at the same time, we read different parts of scripture out loud all at the same time, we joined in other people’s songs and readings. It was out of our comfort zone, but really cool to try these new ways of connecting with God in prayer. Then we asked for a volunteer who wanted to get prayed over, and we listened to God to hear words for this person, or pictures or just asking God to show this person something. We prayed over two people, one of whom was a 13-yr old boy. He asked us to pray against spiritual apathy in his life. The Holy Spirit just exploded! We are not a particularly charismatic church, so again, this is kind of new for us, but it was amazing! The words that other teens were hearing from God just went straight to this boy’s heart. His life was changed. I felt something very significant happen in the spiritual realm as we prayed and prophesied. So then the team decided that they wanted to pray for everyone in that same way. On Thursday evening, after a full day of work, then hearing from Pastor Ace, we sat down to pray. We started at 8:15pm and didn’t finish until after 12:30am. Seriously, these teens prayed for over four hours and they were totally into it the whole time! Some of these kids wouldn’t have even spent 10 solid minutes in prayer ever in their lives and they prayed for over 4 hours! It was a miracle and everyone was enjoying hearing from Holy Spirit so much. We prayed and prophesied over each person. Lives were changed and deep things happened.”Jill, it was amazing. The Holy Spirit just fell on us. We went into this with nothing planned and no idea how we would be praying or anything. I think this turned out to be a great thing. I sure couldn’t have planned what happened there. I’m so excited how this will carry into our youth ministry this year. The kids are making plans to have a monthly prayer night to pray over each other and pray for the world. It’s so powerful when God is doing it IN THEM and not just through the leaders. Praise God for meeting with us, for being gentle with us and for providing a place like The Vine to experience Him in new ways. God bless you and your team. Thanks for making those arrangements to open up specially for our team. It sure was a God-appointment!